If you want to be a faithful priest to God in this area of intercession, you must first acknowledge your total inadequacy. Hence, you must be totally dependent on Christ and the Holy Spirit to do this great work of God. when you get this feeling of inadequacy, thank God! This feeling is good. For it is God’s designed way of bringing us to Him so that we may receive the necessary resources in order to intercede for others. Just as with the man in the story who felt desperate to supply the need of his friend who had come on a long journey, in which case God did help him to seek Him and supply that need, we too may benefit from times when we feel that we desperately need His help. For He has planned all along for us to feel inadequate and desperate so that we will come to Him desperately, quickly, and boldly. For He has all the power, all the money, all the wisdom, all the love, and all the comfort we will ever need He has all that we lack, and we can take it all and give it all to others by our intercession. Now, after you have received this feeling of inadequacy, and you have humbly sought God’s help in how to intercede, look to Jesus first before all others who will teach on this subject. For prevailing intercession has always been Christ’s great priority. Even when He was on the cross He did not forget that He was an intercessor, as He prayed, “Father forgive them; for they know not what they do.” With such an example as this in our thoughts we can’t go wrong. We can also look to our Lord’s example in John 17. Here in this eminent prayer He has demonstrated for us the very best method of intercession. The best method of intercession. Here, in John 17, Jesus first prays for Himself (verses 1-5), then for His disciples (verses 6-19), and last for all people of all ages who are and will become believers (verses 20-26). And so as we begin our time of intercession it is preferred to begin praying for ourselves, then for those closest to us, then for those not so close, and continue our praying in wider and wider spirals until our prayers reach out to the farthest corners of the earth. As we begin in prayer for ourselves it is not with the intent of self-satisfaction and glorification, but rather for the single purpose of the Fathers glory. We see this in the prayer of Jesus as He prayed, “Father, the hour has come. Glorify Your Son, that Your Son also may glorify You” (John 17:1). So as we begin praying for ourselves, pray that Christ would be glorified in us in order that the Father would be glorified. As we see from both prayers, the main idea is that the Son would be glorified in us so that the Father would be glorified. Now, after we have spent sufficient time in prayer for ourselves—enough to get our relationship with the Father straightened out, then and only then will He give us the power and the motivation to intercede for others. First, as Christ did, we should pray for our disciples—those whom the Father has given to us, whom we have witnessed to and spoken Gods Word to. Our first prayer for them should be that they would receive God’s Word that we have given to them. Secondly, we should pray that they would be kept from the evil one. And third, that they would be sanctified by the Word (John 17:6-19). 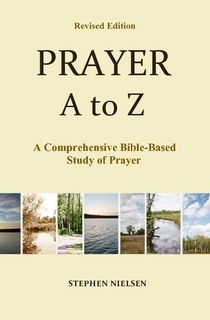 There are many other things that we could pray for them, which I have already outlined earlier in this chapter. After we have prayed for our own disciples we must also pray for those we don’t know as well, and even for those we don’t know at all. I think that the main thrust of our intercession should be for believers; however, we must also pray for the unbeliever, that they would be saved. As we approach this enormous task of praying for so many people, we may get frustrated and want to cut our prayer time short. But we must keep at it and ask God to strengthen us for the task. I suggest that before you get started at the work of intercession that you prayerfully make a list of all the people you think God would want you to pray for. Plan ahead for this enormous task. See how big of a list you can make under each heading. But don’t make it so big that it is impossible to pray for them all. Only list those people, groups and items you feel God wants you to pray over. But you don’t have to pray over every item and every person every day. Pray for as many as you can and save the rest for the next few days. Perhaps you will want to spread your list over a period of a week’s time so you can be sure you get every item prayed for at least once a week. I suggest also that for those items that you think are more important, pray for those every day, and then for the other items pray for those once a week. Have fun with your prayer chart. Design it however you want to. But make sure you use it. Prayer is a lot of work and requires a lot of endurance. Keep at it and God will bless you. This entry was posted in Intercession -- Parts 1-3, Prayer A to Z Excerpts and tagged intercession, John 17, Matthew 6:9-13, prayer. Bookmark the permalink.